CC 337: Free Range [G1937] - $9.00 : Yarn Tree, Your wholesale source for cross stitch supplies. 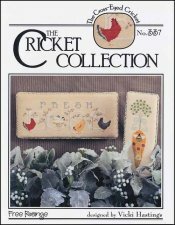 Cross stitch pattern by Cross Eyed Cricket. Two designs. The first design features the words "Fresh eggs" accented with chickens and trees. The second design features a bee on a carrot that has ribbon tied around it. Stitch counts: Fresh Eggs 164w x 66h and Bee's Garden 35w x 127h.